As mandates continue to grow for the Federal Government, Infoblox is delivering solutions to help you meet your most demanding challenges. From the White House to USCYBERCOM to the GSA and FFIEC, government oversight and regulatory agencies are calling for more and better security against cyberattacks. Of the various types of threats, DNS-exploiting malware is perhaps the most dangerous. Using DNS servers, malware can sidestep conventional firewalls, leaving federal networks unprotected despite millions of dollars invested in outward-facing security solutions. 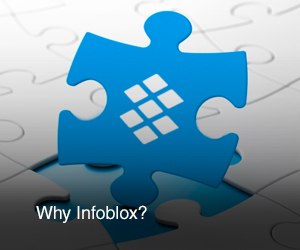 Infoblox solutions are purpose built to deliver the control and visibility necessary to achieve network efficiency, quality, and flexibility. To help federal organizations get a full return on investments in virtualization and cloud initiatives, Infoblox delivers full network automation for managing change in cloud environments. Infoblox’s automated network solutions are IPv6-enabled and can be used to assist Federal agencies in meeting Office of Management and Budget mandates both during and after their transition to IPv6.